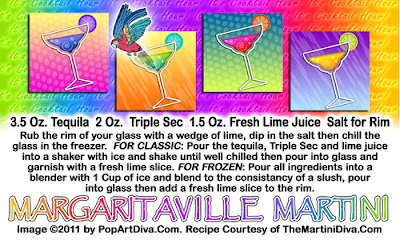 You can't think about margaritas without thinking of Jimmy Buffett and Margaritaville so I had to do a special recipe card for that one. This is the official recipe for a classic Margarita from the IBA (The International Bartender's Association) which calls for a 7:4:3 ration of tequila, triple sec and lime juice. The classic Margarita is served over ice in an old fashioned glass but most contemporary tastes prefer a frozen (blended) version so I have included those instructions as well. You can substitute Cointreau for the Triple Sec, add an ounce of Blue Curacao for a Blue Margarita and, of course, there are the fruit versions for the blended or frozen margarita where you add some fresh fruit to the blender. My favorite of the fruit versions is the Strawberry Margarita because I love strawberries and they add a touch of sweetness to the cocktail that balances the tartness nicely. You can find all my MARGARITA RECIPES HERE.